Inspired by the thread: "Tor-0.2.5.12 can crash OpenBSD-5.7-stable"
I can see that DragonFlyBSD is a fork of FreeBSD 4.8. and OpenBSD was forked from NetBSD in late 1995. But that doesn't help much. 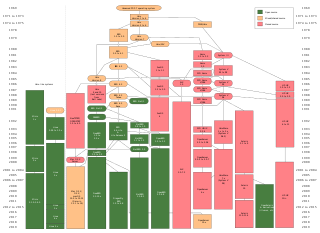 The Wikipedia entry for Unix has this diagram (below) but it doesn't have adequate resolution into the BSD subspecies (to help with my speculative thinking). : Information resolution. A higher visual resolution file is hyper-linked to the image. I'm thinking about how some of the DragonFlyBSD capabilities and features might be useful to OpenBSD users, developers and engineers. I'm trying to get a probable architectural gist of how different the OpenBSD and DragonFlyBSD kernels are from each other, with an eye on engineering concerns. And I wonder if it would make sense, theoretically, if a new generation of OpenBSD had some of (or all) the Dragonfly developer-engineer-operator tools/features and some of (or all) the process-cluster capabilities/possibilities (including HammerFS if it makes sense). The optimist says, “The glass is half full”. The pessimist says, “The glass is half empty”. The engineer says, “The glass is twice as big as it needs to be”.